This fragment is still under translation, but it mentions sky dragons. 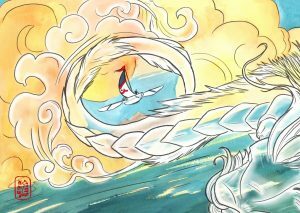 As far as we know, sky dragons are entirely friendly and have no connection to the leviathan itself. However, there does seem to be a link between the leviathan and the magical undercurrent running through Kanvala.